Roast corn in husks on the grill until charred, approximately five minutes on each side. Preheat oven to 400 degrees. Line a pan with aluminum foil and place peppers with stems facing sideways and roast until peppers have a char and are tender. Blanch fava beans for two minutes; peel. Remove cornhusks and run a knife down corn to remove kernels; set aside. Peel, remove seeds, and slice bell peppers lengthwise. 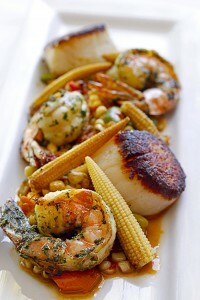 In a hot sauté pan, heat two teaspoons of oil, place the scallops and season. Once the scallops have a nice sear (golden brown color), flip over and continue to cook until medium rare. This should take approximately two minutes. In the same pan, sauté the prawns; season. Prawns will be sufficiently cooked when they turn white; this should also take about two minutes. Once cooked, remove scallops and prawns. In a separate sauté pan, sauté garlic in butter. Add corn, fava beans and bell peppers; season with salt and pepper; toss. On each of two plates center corn, fava beans and peppers. Place scallops and prawns on top and finish the dish with fresh lemon juice.